that transition occurred absolutely naturally. 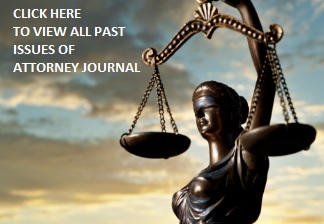 These days as a mediator with Judicate West successfully resolving cases, saving time and money for the parties involved, are the benchmarks of victory. That love of competition became the pursuit of the “Win/ Win” resolution for Denton. Judge Denton’s interest in the law was initially piqued in the late 1960’s. “I was in college and major social issues such as the Vietnam War and the Civil Rights Movement dominated society, and the law was exploding. Law was where the action was, and I wanted to be a part of it,” Denton explains. Judge Denton got his first opportunity to advocate for specific sides of a story while still in law school. “The summer after my first year in law school, I took a job as a law clerk with Ludecke & Andreos for $2.35/hour. I wanted in the worst way to get onto the first rung of the ladder. They gave me a spot on that first rung. I spent far more time working with Alan Ludecke and George Andreos in the firm than I did in class. I also sat second chair on a murder trial while still a student. After I graduated in 1975, I took a job as an associate, a few years later was a partner, and essentially never left. Alan and George served as great mentors to me. They treated me with respect, and as a peer and included me in every aspect of lawyering even when I was just starting out in law. I spent a total of 26 years with that firm,” he recalls fondly. Over the course of his long career as a trial attorney, Denton was more than just involved in the legal community; he was immersed in it. He served as President of the San Diego Chapter of ABOTA, CASD, and Wallace Inn of Court, in addition to serving as Vice President of the San Diego County Bar Association. He also racked up no end of awards. As a litigator, he was awarded the David S. Casey Trial Lawyer of the Year, and six individual case Outstanding Trial Lawyer awards. His alma mater, University of San Diego School of Law’s Alumni Association named him Distinguished Alumni of the Year in 1995. With his numerous awards for excellence as a litigator, and his obvious dedication to the San Diego legal community, it perhaps shouldn’t have come as a shock when he was approached to become a judge, but Denton admits to being rather surprised when it did happen. “It is relatively rare for a career plaintiff’s personal injury lawyer to get the opportunity to be appointed to the Superior Court,” Denton says. “In 1999 my colleague, David Casey Jr. invited me to play golf with him. David was an advisor to the governor and senators concerning both the State and Federal judical appointment process. I should have known something was up,” Denton chuckles. “During our morning together, he prevailed on me to consider filling out an application for judgeship. I was about 50 years old and had been a trial lawyer for about 25 years by then, and even though it meant giving up a thriving law practice, I decided I wanted to serve as a judge,” he says. “What I enjoyed most as a judge was watching great lawyers in jury trials on significant cases,” Denton says of his 12 years on the bench. “It was a joy to preside over trials where both sides were represented by gifted attorneys,” he adds. Make no mistake, Judge Denton presided over a lot of cases. “While on the bench, I had the opportunity to serve in both the Family Court and the Civil Court in judicial settlement conferences. Having served for the last eight years as Superior Court Judge in an independent calendar civil department, I presided over up to 1000 cases at any given time. Those cases ran the gamut from the most complex business litigtion matters to class actions to product liability and personal injury cases as well as any other types of civil case you can imagine. Because the San Diego Superior Court never instituted a ‘Complex’ department, all of the IC judges each handled their own share of complex cases. All of the cases were handled from soup to nuts, from filing through law and motion and until trial assignment by the IC judge,” Denton explains. After 12 years on the bench, Denton determined that the time was right to put his years of experience to work in alternate dispute resolution. He and his wife Cynthia Chihak, a very busy full time San Diego Plaintiff’s litigator, are parents of children ages four and six. “We are on our second litter, as Cindy calls it,” Denton says proudly. “The time demands of running a civil independent calendar department made it difficult to spend the kind of time that we wanted to have available for the kids,” he says. Moreover, “the court’s budgetary crisis served to increase the time pressure in the civil court justice system for all of the judges,” Denton says. “Rather than trying to squeeze a gallon into a quart container, I determined it would be better to transition to a position that had more flexibility.” Furthermore, “delays in trial dates resulting from the budget crisis in the larger or more complex cases have a direct consequence of increasing litigation and transition costs. The alternate dispute resolution field will, by necessity, have to increase in capacity to deal with helping people get cases settled without that increased litigation cost. It just makes sense to resolve most cases as soon as the facts and issues can be reasonably appraised,” he adds. In his new role with Judicate West, Denton is eager to put his extensive experience in the trenches as a trial lawyer and time on the bench to good use. “Efficient mediation means meticulous preparation combined with a ‘get-down-to-business’ assessment of factual and legal disputes. My job is to facilitate a realistic case appraisal by all parties to reach a settlement without unnecessary time utilization. My style is to challenge each side with the facts and evidence to get all participants to see the case through the eyes of their opponent in order to move toward consensus,” Denton says.